Why Companies Need vMPLS from ClearTrunk, The Plug and Play MPLS Alternative. 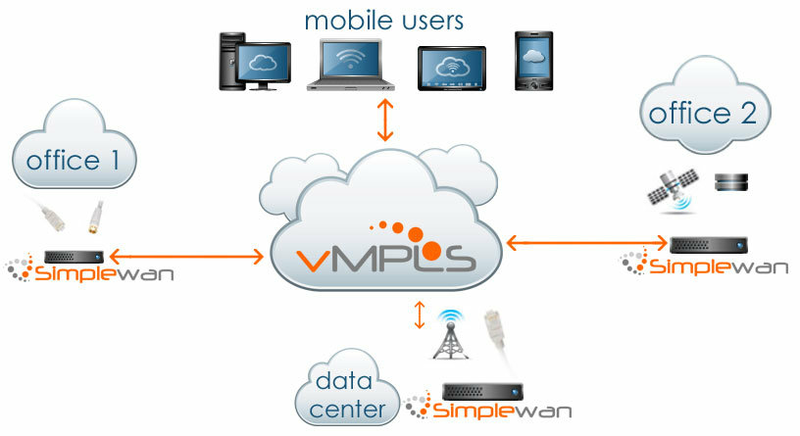 vMPLS, or Virtual Multiple Protocol Layer Switching technology is a SimpleWan™ service that allows users the ability to connect multiple geographical locations through a secure carrier-neutral managed network, providing access to the entire corporate network securely from any location, leveraging the full benefit of network based technologies. Companies with locations in different states will find it nearly impossible to find one carrier who can cost effectively provide a private and secure Ethernet network that connects all of their locations. SimpleWan™ makes it possible by providing a carrier-neutral deployment system. vMPLS is based on SimpleWan™'s Patent-Pending Smart Routing Technology which leverages over dozens of private backbone connections to provide the shortest distance routing between endpoints, no matter where they are located. By leveraging broadband access that is readily available, SimpleWan™ provides scalable and flexible solutions that are cost-effective for even the most price-conscious customers while still providing a state of the art solution. Deploying a traditional Fully Meshed Wide Area Network has traditionally been extremely costly, time consuming and difficult. With SimpleWan, you provide electricity and any Broadband connection and SimpleWan will build your own private and secure cloud with Fully Meshed topology. Our vMPLS routers are provided and installed at each location, those locations will be granted secure access to your company's cloud with full cloud-view connectivity to other locations connected to your private infrastructure. Mobile users will have the ability to connect into your cloud from any location and just about any device.